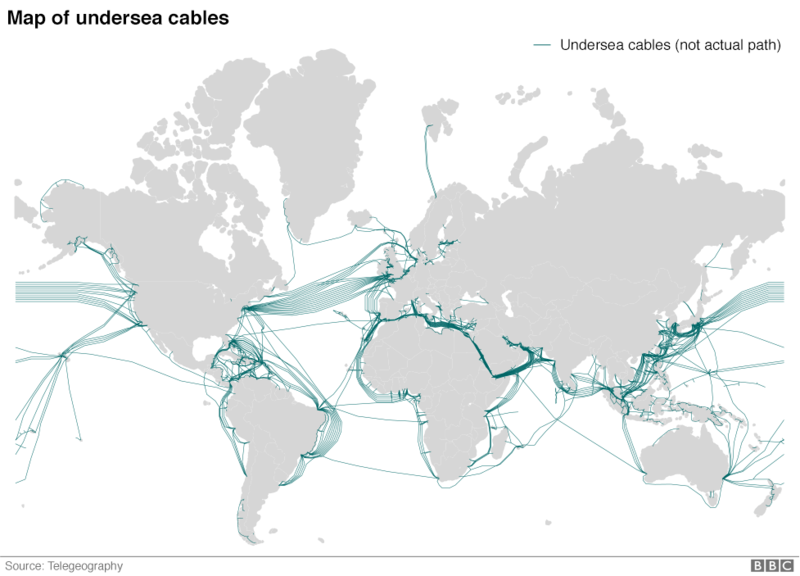 Where are the world's undersea cables? Hundreds of thousands of miles of undersea cables circle the globe, providing internet and communications links between nations and continents. The UK's most senior military officer has warned that these cables should be protected as a priority in the face of a new threat posed by Russia. Air Chief Marshal Sir Stuart Peach said it would be an "immediately and potentially catastrophic" hit to the economy if they were cut or disrupted. There are approximately 428 submarine cables, running 683,508 miles (1.1m km) around the globe providing internet and communications links. Such networks can become overloaded if major failures occur - particularly if so-called "pinch points" are hit by natural disasters. The port of Alexandria in Egypt - at the centre of the map above - is often at risk from ships dropping anchor and severing cables - putting strain on connections between Europe, Africa and Asia.